And it's more of a problem than you think. Did you know Malaysia Airlines Flight 17 was full of corpses when it took off from Amsterdam? Did you know that, for some darkly inexplicable reason, on July 17, MH17 moved off the standard flight path that it had taken every time before, and moved north, toward rebel-held areas outside Donetsk? Or that the dispatchers summoned the plane lower just before the crash? Or that the plane had been recently reinsured? Or that the Ukrainian army has air defense systems in the area? Or that it was the result of the Ukrainian military mistaking MH17 for Putin’s presidential plane, which looks strangely similar? Did you know that the crash of MH17 was all part of an American conspiracy to provoke a big war with Russia? Well, it’s all true—at least if you live in Russia, because this is the Malaysia Airlines crash story that you’d be seeing. As the crisis surrounding the plane crash deepens and as calls for Vladimir Putin to act grow louder, it’s worth noting that they’re not really getting through to Putin’s subjects. The picture of the catastrophe that the Russian people are seeing on their television screens is very different from that on screens in much of the rest of the world, and the discrepancy does not bode well for a sane resolution to this stand-off. Western media has been vacillating for days between calling Putin a murderer and peppering their coverage with allegedlys, telling the heart-rending tales of the victims, scrounging for anonymous leaks to link the Russians to the downed jet, and punditizing about exit ramps. But in Russia, television—most of it owned or controlled by the Kremlin—is trying to muddy the water with various experts who insist that there is no way that an SA-11 missile system could possibly have downed a plane flying that high. And, mind you, this is not part of a larger debate of could they, or couldn’t they; this is all of Russian television and state-friendly papers pushing one line: The pro-Russian separatists we’ve been supporting all these months couldn’t have done this. Watching some of these Russian newscasts, one comes away with the impression of a desperate defense attorney scrounging for experts and angles, or a bad kid caught red-handed by the principal, trying to twist his way out of a situation in which he has no chance. Then it was taken to Holland. On the necessary day and hour, it flew out, bound for Malaysia, but inside were not live people, but corpses. The plane was flown not by real pilots; it was on autopilot. Or take-off (a complicated procedure) was executed by live pilots, who then ejected on parachutes. Then the plane flew automatically. In the necessary spot, it was blown up, without even using a surface-to-air missile. Instead the plane was packed with a bomb, just like the CIA did on 9/11. But though it may look unconvincing to us in the West, that is because we have seen and read other things that contradict it. The Russian media space has become so uniform and independent voices so cowed and marginalized that there is no counterweight and, when there’s no counterweight, if you repeat a thing often enough, it becomes the truth. This isn’t an innocent you-say-tomato moment; this is a very problematic development. 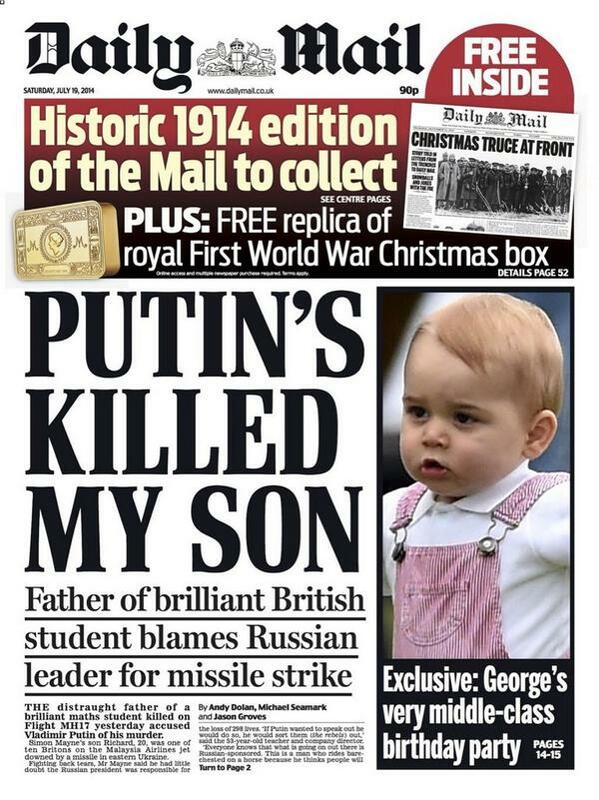 The result of all this Russian coverage is that Russians’ understanding of what happened is as follows. At best, the crash is an unfortunate accident on the part of the Ukrainian military that the West is trying to pin on Russia, which had nothing to do with it; at worst, it is all part of a nefarious conspiracy to drag Russia into an apocalyptic war with the West. So whereas the West sees the crash as a game-changer, the Russians do not see why a black swan event has to change anything or they want to resist what they see is a provocation. To them, after a few days of watching Russian television, it’s not at all clear what happened nor that their government is somehow responsible for this tragedy. And the more we insist on it, the less likely the Russians are to agree. Floriana Fossato, a longtime scholar of Russian media, says that this, coupled with the media’s conscious use of the Soviet language of crisis—“traitors,” “fascists,” “fifth columns”—quickly brings to the surface the psychological demons of a society massively traumatized by the twentieth century, traumas that society has never adequately addressed. The result, she says, is a kind of collective PTSD-meets-Stockholm Syndrome. But in addition to the Russian public not clamoring for decisive action from Putin, there is a far more serious problem. As The New Yorker's David Remnick noted in his column on the crash of MH17, Putin has become prisoner to his own propaganda machine, much as he’s become prisoner of the rebels he thought were doing his geopolitical dirty work in Ukraine. After Putin’s ascent, media became the flexible element that could be readjusted for any twist or turn of the political rudder. “Today, it’s the opposite,” says Gleb Pavlovsky, a political consultant who helped Putin win his first election and was a Kremlin advisor for years afterwards. “It’s almost impossible to turn the rudder of the picture that’s formed on television because it would mean losing the audience they formed in this year” of sword-brandishing and imperialistic conquest. This has had a noticeable impact on the ruling class, Pavlovsky says, which has to watch this stuff in order to stay au courant. And they become less sane as a result, too, which limits their ability to adequately assess a situation such as this and devise a good way out of it. “It’s noticeable that the Kremlin is much more tempered than Russian TV but can’t change it,” Pavlovsky says. “It’s fallen into a trap, so it's now trying to function within the strictures of this picture.” He cites the example of the PR contortions the Kremlin had to use just to announce that it would not send troops into eastern Ukraine. “In this seemingly controlled media, any rational political arguments of the state have to be hidden and packaged in idiotic, jingoistic rhetoric,” Pavlovsky says. None of this looks very good for the West, which is clearly hoping that MH17 is the thing that will bring Putin to his senses and get him to agree to some kind of off-ramp, or, at least, a deescalation. But that’s hard to do if neither your public nor your political class see it as a game-changer or as anything that should force Russia to end this game.